Home via Amsterdam. Life at Schiphol. Our trip back home from Bucharest took us through Amsterdam again, where we spent several hours between flights at Schiphol airport. 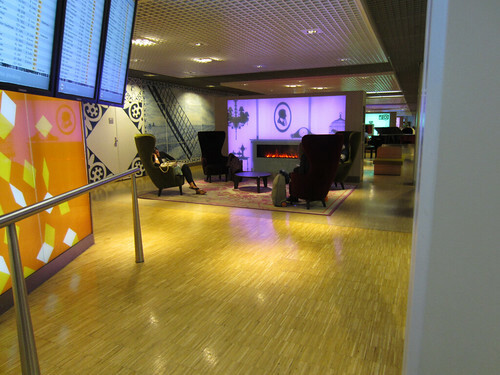 I've blogged about Schiphol a couple of times before. We probably have logged more time there than at any other airprort in the world. There is always something new to see or do. 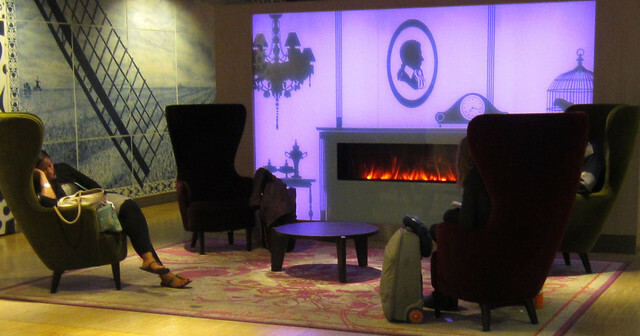 We exited our KLM flight from Bucharest and headed into the main lobby near the Rijksmuseum Amsterdam Schiphol - a small art museum in the airport lobby between concourse E and concourse F. There are usually some comfortable chairs in that area. Too bad that most of the chairs are taken. On the other side of that screen is another room. That one has a baby grand piano. The sign above the keyboard is very welcoming. While we waited, one young boy came along to play a couple of tunes. He was followed by another boy of slightly better accomplishment. Finally, someone came along with even more flair and began a lengthy program. Now you might have noticed a coffin or iron-lung like device behind the piano. That is the water massager that has been a feature of the area for quite a few years. 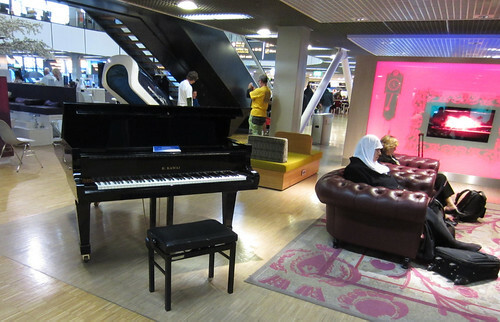 As the piano played, the massager accompanied with its unique sounds and passers-by mostly just kept moving except for a few of us who always find there is something special about a trip through Schiphol. Bucharest, Romania. It's About Time! It's getting close to the time we will be leaving Minnesota for a warmer area, and I still haven't finished with our visit to Romania. I had better catch up. 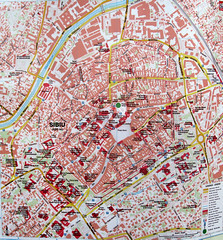 Edward, our guide and driver for the previous ten or so days provided a driving tour of Bucharest and then a walking tour of the older part of the city. After that, we were on our own for another two days. 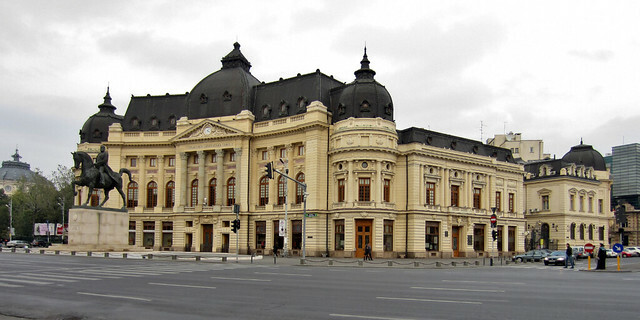 Bucharest is an attractive European city combining some historic elements, some modern and a diminishing number of boxy structures from the Communist era of the 1950s and 60s. In some ways, the tree-lined boulevards and monuments are reminiscent of Paris. One building that doesn't fit neatly into any category is the Palace of the Parliament. A fourteen-story building measuring about 800 feet on each side, this building is home to both houses of the Romanian Parliament and numerous government offices. 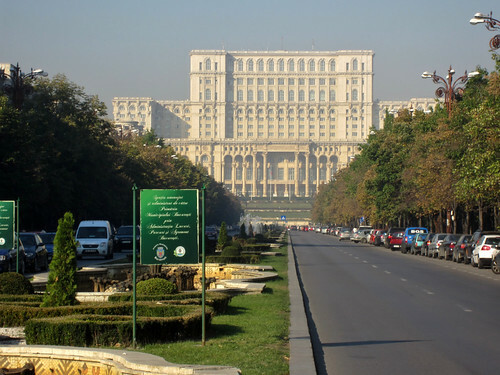 Its construction was begun in 1983 and was largely complete at about the time of the fall of the Ceausescu government in 1989. 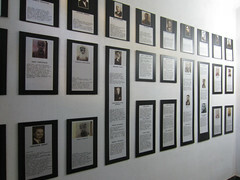 It is open for public tours Monday through Thursday. Unfortunately, we were in Bucharest Friday through Sunday. 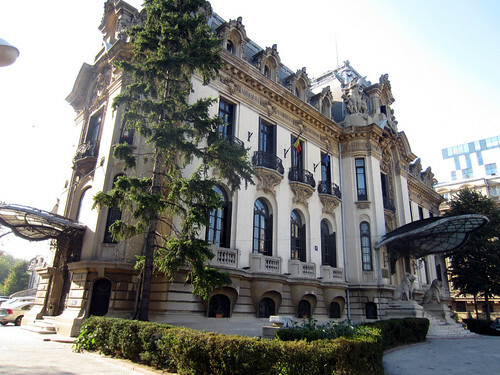 The cultural center of Bucharest surrounds two almost adjacent areas, Victory Square and Revolution Square. A large National Art Museum with a remarkable collection of Medieval Art can be found in this area as well as the Central University Library shown below and the previously blogged Athenium concert hall, visible at the left edge of this picture. 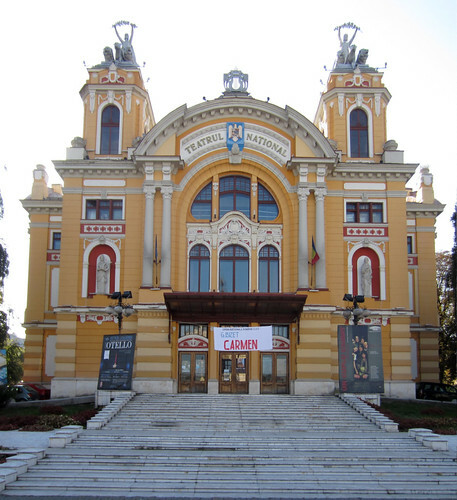 Romanian's are very proud of their composer, George Enescu. 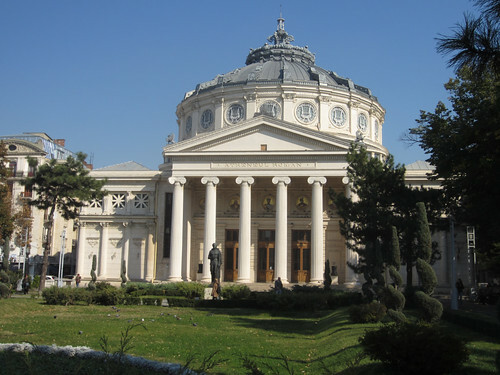 Famous as a violinist and conductor as well, during the 1920s and 30s, his former home in Bucharest is now a museum. 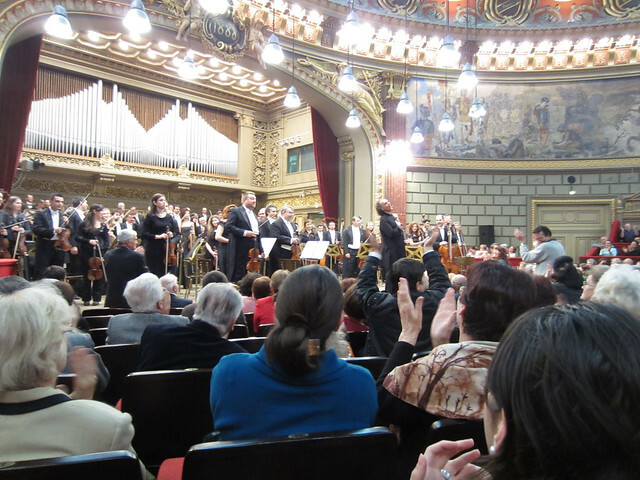 Try this YouTube link if you would like to listen to Enescu's Romanian Rhapsody. 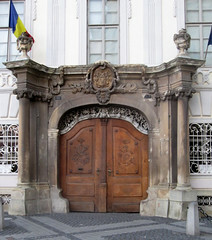 About a mile away from this area in "Old Bucharest," a large area is restricted to pedestrians. 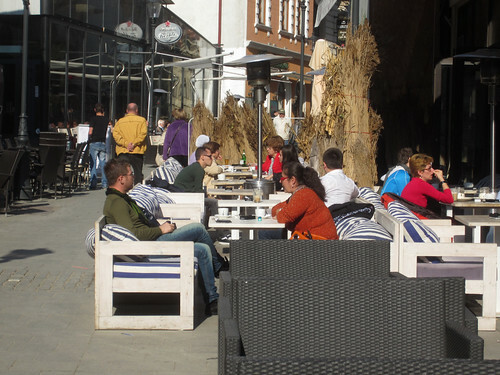 Shops, street performers, sidewalk cafes and other restaurants provide an entertaining break from the serious sightseeing. 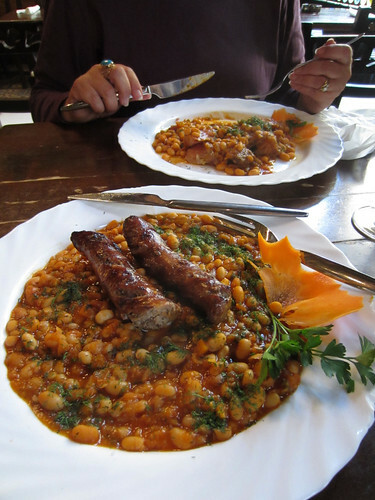 And, in Bucharest, we enjoyed the best food of the trip. 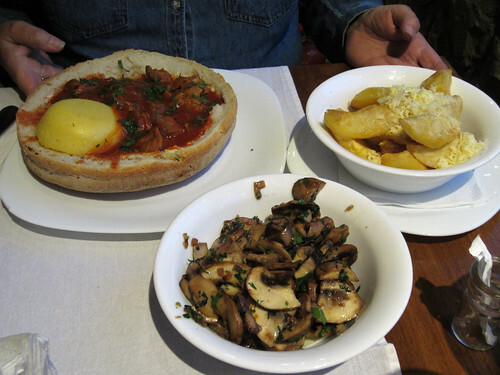 Prices were about one-third of what we had experienced in Greece and Italy at the beginning of the year. Romania gets two definite "thumbs up" from Linda and Tom. 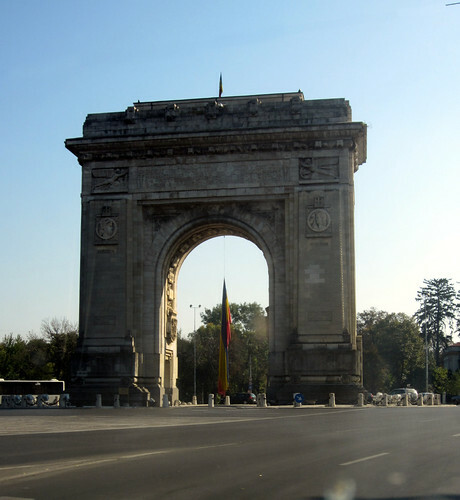 Our hotel in Bucharest is just a few steps from Calea Victoriei (Victory Avenue) in the downtown area. It is about a three block walk to the Athenium concert hall. Our tour guide, Edward, from Medieval Tours was able to find tickets for us to the Thursday evening concert there. Now, ordinarily, I wouldn't spend an evening at home listening to Beethoven and Brahms. But, what's that old saying? 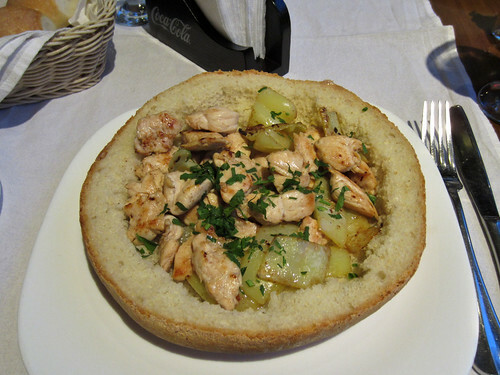 When in Romania, do as the Romanians do! 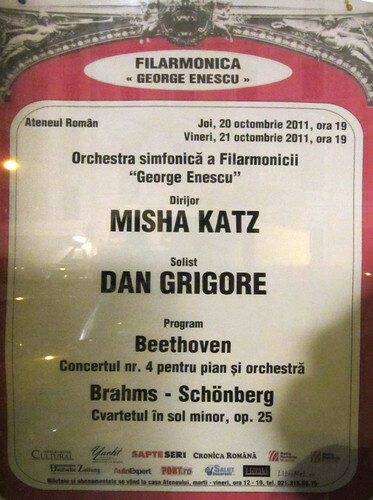 The soloist on the piano, Dan Grigore, is a well known Romanian and received much applause from the crowd. 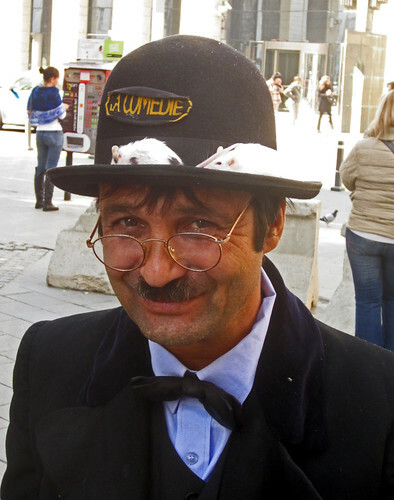 My favorite though was director Misha Katz, a native Russian who resides in Paris. (A couple of YouTube videos show Katz. His enthusiasm comes through around 1:24 on this one.) He was by far the most enthusiastic and animated director that I have ever seen. He expressed joy and enthusiasm throughout the concert. Following the applause and a few curtain calls at the end, he spoke to the audience in French, a language well beyond my skills but which Linda would translate for me later. I'm not sure we totally understand the protocol for behavior at a concert like this. I couldn't find anyone smiling during the performance. During the movements, which were about fifteen minutes in length and immediately thereafter there was total silence. Then, simultaneous coughing and clearing of throats for about fifteen seconds, fading quickly to perfect silence again. While I enjoyed the show, I'll still choose John Fogerty the next time he's in town. To which I should add, Elvis Costello will be here in Bucharest on November 3rd. 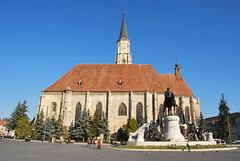 From Cluj, we continued south to the city of Sibiu, Romania. 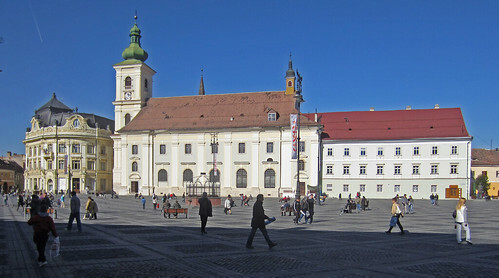 Sibiu, with a populations of around 150,000 lies almost exactly in the center of Romania and lies just to the north of the Carpathian Mountains. Driving into town the first view is not encouraging. But it turns out that there are three public squares in the older part of the town and some nicely restored buildings. These town squares provide a focus for the very old Lutheran church and somewhat newer Roman Catholic church. We spent part of the following morning at the art museum which featured Romanian Impressionists as well as a collection of European masters. 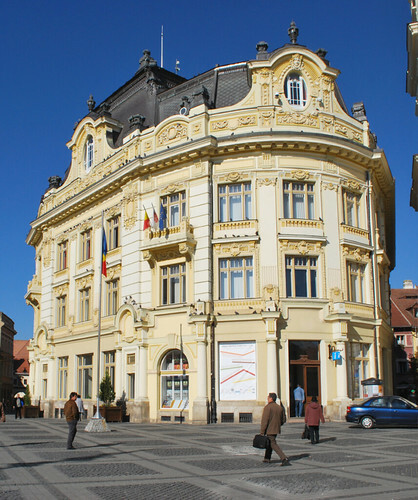 The general attractiveness of the buildings on the square is probably one of the reasons that Forbes magazine rated Sibiu, "Europe's 8th most idyllic place to live." 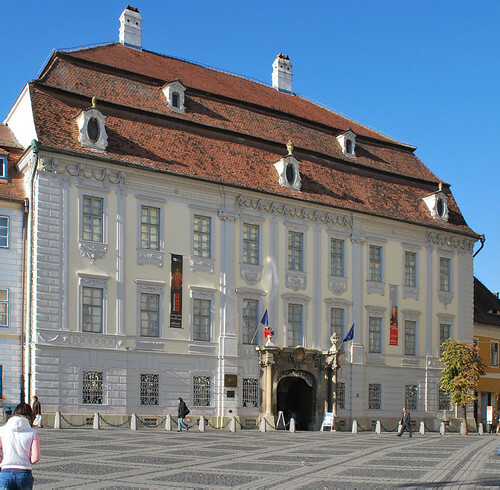 Sibiu was also named one of the "European Culture Capitals" in 2007 and has been the focus of some of England's Prince Charles Romanian activities. The rooftops are pretty, especially the ones with "eyebrow" windows. And, Linda found a some doors to photograph and add to her collection. 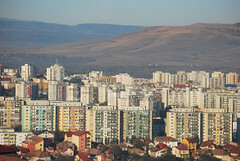 Our first day's journey south ended at Cluj-Napoca, a city of around 400,000. 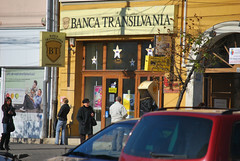 Cluj is back in Transylvania and is definitely big-city living. It holds a large cathedral, Saint Michaels in a square at the heart of the town. We spent the next morning walking some of the streets near the square. 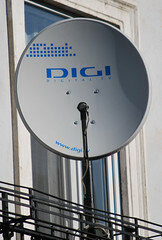 Satellite television means that the Discovery channel is on in the restaurants. That in turn brings an "As Seen on TV" type store to the area. Other signs of big-city life can be found, too. There is a very pretty Opera House. 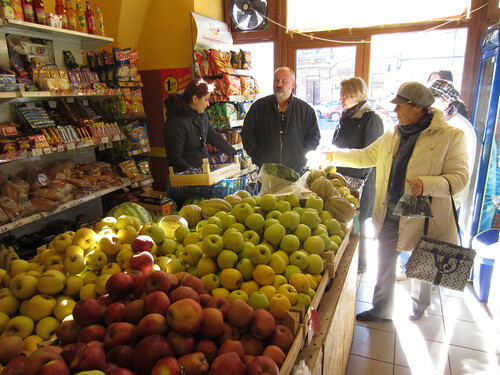 And we spent some time looking at a fruit market along one a pedestrian mall. After leaving Sighet and beginning our return to the South we stopped in a couple of larger cities. This meant leaving behind much of the rolling hill country, the sheep farms and horse-drawn wagons. 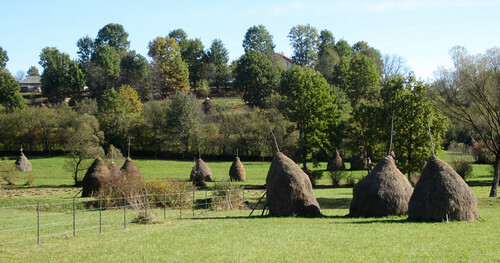 One of my favorite countryside sights is the distinctive Romanian haystack. We stopped and took several more pictures of those. And we stopped for one more flock of sheep on the hills, too. "Why Romania?" many have asked. 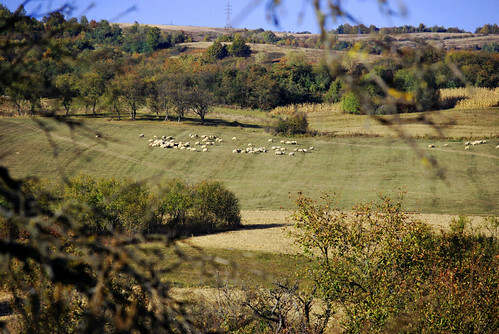 Romania is absolutely charming, especially the countryside. Words can't begin to describe the beauty of the farms and herds of sheep dotting the wide valleys between the snow covered mountains or the charm of the country houses decorated with designs we never see in MN or the fascinating groups of gypsy women in such color combinations that our adult imaginations would never conceive. 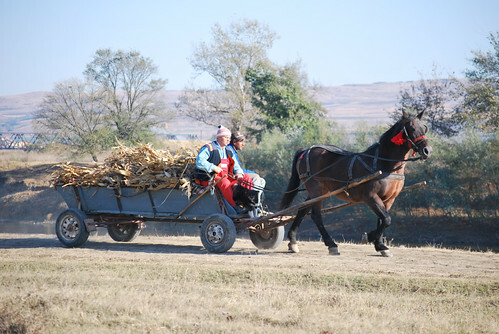 My fascination with Romania is with the gypsies and I'm in "gypsy heaven" here. I see them every day and I love it. Luckily they stare at me since I look so different so I don't feel bad when I stare at them. Rationally I know they have a tough life but I find the idea of their life very romantic. 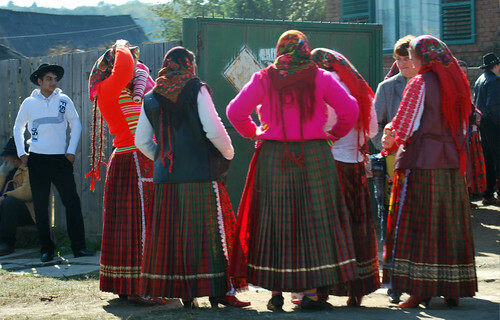 Most gypsies in Romania are settled in housing and their houses are as colorful and decorated as the women are. They are every color of the rainbow but in the brightest hues and the roofs are adorned with lacy aluminum scallops and curlicues. All I can say is "Wow!" 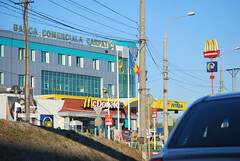 It's an easy country in which to travel; hotels are modern, food is plentiful and Romanians love Americans. Our guidebook says that one third of Romania is mountains, largely forested. One third is hill and plateau. One third is plain mostly intensively farmed. That seems about right to me. A close friend who had been here some years ago suggested that I would find it much like western Oregon and Washington and he was right on target with that description. Here is a "windshield shot" of our approach to the Carpathians from the north side. The small city of Sighet Marmatiei has a population of around forty thousand. 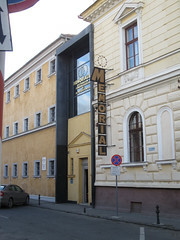 It has, as one mark of distinction, the birthplace of Ellie Wiesel, holocaust survivor and author. 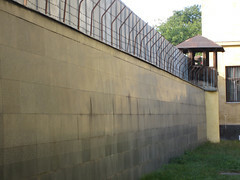 A much darker distinction is the presence of the Sighet Prison where the former communist government held political prisoners. 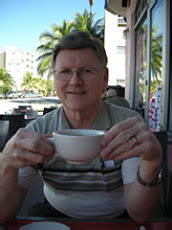 It is probably unknown to many younger Americans just what life behind the Iron Curtain was like. Traveling with Edward from Medieval Tours has been a good reminder. 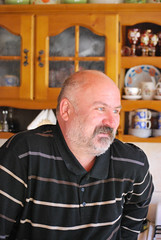 Edward grew up late in the Communist Period but remembers very well the oppressive conditions. 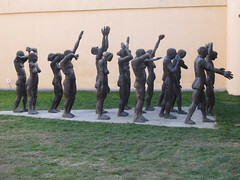 His ability to supply personal anecdotes about the communist times added a lot to the tour. 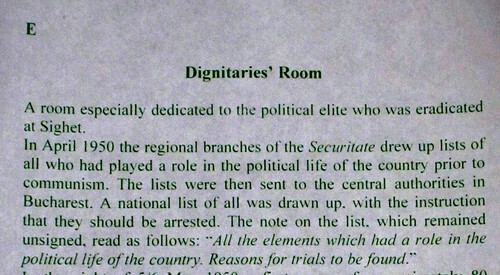 This excerpt from one of the English-language guide pages at the prison tells the beginning of the story of this particular prison. 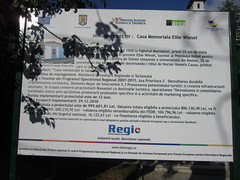 The Sighet prison was one of several such prisons in Romania. A cemetery just outside of town has a memorial near the mass graves that resulted from the terror inflicted here.